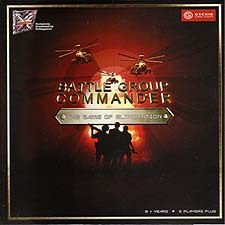 Every second counts in this action packed game of strategy and tactics, as each player attempts to take control of the battlefield and become absolute commander. Skill, cunning and tactics are the only thing that will see you through! If you think you have nerves of steel, and the strength of character to make men take the battle to the enemy under a hail of withering fire, then maybe you can be "Battle Group Commander"! Soften the enemy up first with pop up attacks on any unit that is getting too close with the helicopter, or bombard longer-range targets with the launcher. Try and take out as many of the enemy specialists as soon as possible, but remember while you are doing all that to your enemy, they will be trying to do the same to you!